We are a “modern” medical practice and skin cancer clinic, which currently runs with a female and two male doctors, psychologist, two registered practice nurses and operate alongside with SydPath St Vincent’s Pathology, who provide a Pathology collection centre that accepts all referrals. Access expert medical advice when you need it. Our friendly team aims to provide quality patient care and “Inspire Better Health”. It is chosen by a person to be responsible for their ongoing, comprehensive and holistic medical care. Patients and their families have a continuing relationship with their GP. This partnership is supported by the practice team with the GP and the whole team coordinating to provide the care needed to optimise health. We are situated in the heart of the Camden South surrounded by a rapidly growing community. 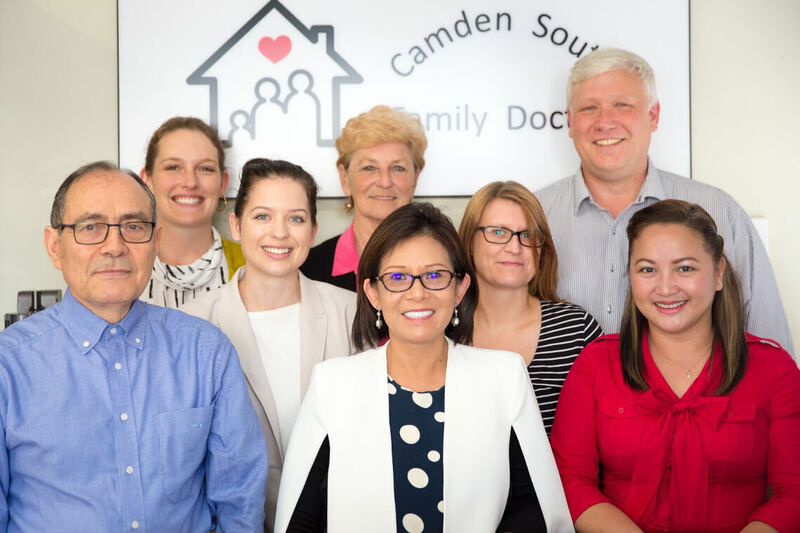 Camden South Family Doctors is a “new purpose built” medical practice and our core value is to provide the best possible care to our community. We aim for a multidisciplinary approach that facilitates quality patient care, safety for the patient, professionalism and operates with integrity. We inspire and promote positive and better physical and mental health and wellbeing to all. Treating the whole person rather than just focusing narrowly on managing diseases is the system we uphold. We encourage and assist in self-care strategies that require lifestyle changes. In order to better serve you and manage your health, we provide an Appointment system to see a Health Provider with us, where we prefer that you book online at this website, or instead simply ring reception beforehand to book an appointment. This assists us to spend quality time with patients where it is needed. If it is an Emergency – Call 000 or go directly to your nearest Hospital. If it is very urgent call us and we will always fit you in. Please speak to our receptionists to discuss if you need to be seen quickly. Please help Reception to aid appointments run smoothly by stating if you need a longer appointment for any reason when booking. If you are unsure, please discuss this with our friendly receptionists. This will allow the doctor or nurse to spend the time needed to assist you. We would be ‘very grateful’ if you could let us know if you are unable to keep an appointment, so that we can allocate your appointment to “another patient”. We have a cancellations list for patients that would like to be seen sooner and they will be called in order of who is placed on the list 1st. We are a Medicare Bulk Billing Practice; most services are Bulk Billed. Private Patients who do not hold a valid Medicare card are billed by length of consultation and are charged $70 for a standard 10min, $140 for a 20min and $210 >20min surgery consultation. Surgical Procedures may incur a cost, i.e. Excluding patients on a pension, all Surgical Skin Incision Removal Procedure Sessions $30. Bus drivers licence Medical Assessment $80. You will be informed of any costs prior to consultation or procedures. Please feel free to discuss any issues with our friendly reception staff. You may receive appointment reminders or clinical reminders via SMS or Letters from our practice, reminding you about an upcoming check or to notify you that your Health Management Plan is due for review. Please Advise Reception if you DO NOT wish to receive such reminders, so we can remove this free service from you file and make a note of your wishes. When you receive a reminder by SMS or Letter, you can book On-Line or simply call the surgery to book an appointment with us. All Results are strictly confidential. Due to the Health Record & Information Act 2002, you must have an appointment with the doctor, to either receive or discuss your results or for the collection of referrals and scripts. After the doctor has reviewed your test results or specialist correspondence, the doctor may request for you make an appointment to follow these up for further discussion. This discussion is often about following-up something that is clinically significant but Non-Urgent for managing your care. SMS’s or Letters are sent out for all Non-Urgent Recalls, to allow you to either directly book an appointment with us On-Line or simply call the surgery. If we are unable to contact you after 2 SMS’s notifications, a Discuss Result’s letter will be send out to your postal address. If your results are significantly abnormal or urgent, a doctor from this practice will contact you. Please make sure that all your contact details are up to date. If you need a Referral you must have an Appointment. Patients can be referred for Diagnostic Testing, to Allied Health & Medical Specialists, which are more specific for the individual patient’s needs. Referral documents are provided to these health professionals and patients are advised that relevant medical information is disclosed in referral documentation to those health providers. This is to Aid these other Health Professionals to better help the patient, by giving them background information into the patients related condition. Please make sure before you go to any Specialist Appointment, that your Referral letter will still be valid from the appointment time with the Specialist. Referrals from a GP are valid for 1 year, however it can take many weeks or months before you can be seen, after which your referral may no longer be valid. If you require a Prescription or a Repeat Prescription you must see the doctor. The doctor cannot give Prescriptions without seeing the patient in a surgery consultation. House calls may be available if you are a patient of the surgery, are unable to come in due to a serious medical reason and after a discussion with the doctor. House calls are available within a 2 km radius. If you feel you need a house call, please contact the surgery before 12.30pm. House calls are normally performed between 2.00pm and 3.00pm or after surgery hours and are Bulked Billed for Medicare Card Holders. Our Practice engages with a range of health, community & disability services to plan and facilitate optimal patient care. We can refer you onto many other services to help with a specific problem or requirement. Please ask the doctor, nurse or reception to guide you to the correct information about any of these services that might be able to help you further. These services can be medical or non-medical help, such as child protection services, domestic abuse, overcome with gambling problems etc. We will endeavour to get you the correct contacts for the right help. Camden South Family Doctors is committed to Improving Patient Care. We value your opinion, and encourage patients to give feedback, both positive and negative about any element of the practice. Feedback can be given in writing and put into the Practice Feedback Box in our Waiting Room, which will be dealt with by the Practice Manager and Staff Team Members. Alternatively, you can speak to reception, who will document feedback, which will be discussed with the Practice Manager and the staff team. Your Medical Record is a Confidential Document. Camden South Family Doctors is committed to maintaining confidentiality of patient’s information. It is the Policy of this practice to maintain the security of personal health information at all times and to ensure that this information is only available to ‘Authorised’ members of staff. Releasing or transferring patient medical records to another identity, can only be done by the patient’s authority. If you have difficulties with hearing or language, assistance with communication is available through the National Relay Service or the “Translating and Interpreting Service” (TIS National). Please don’t hesitate to advice our receptionist, if this is needed. If you need to speak to a doctor urgently, and are unable to attend the surgery, please let the receptionist know and we will put you through as soon as the doctor is available. For non-urgent matters, it would help us if you rang between the hours of 11.00 and 12.30 as this will minimise the disruption to those with appointments. My Health Record, is the National Digital Health Record System. It keeps health information about you, online, such as allergies, medical conditions, medications, test reports and results in one place. It helps doctors, specialists and hospitals connect, to work together so they can see patient’s health information any time anywhere as they need it, which can help in an emergency or when away from home within Australia. Also “My Health Record” will help Australia’s national health system become better connected, resulting in better, faster and more efficient care for everyone. It is a secure and highly protected online system regulated by law just like online banking. Patients Health Records are encrypted and patients can choose who gets to see their Health Record information. From 15 June 2016 all patients listed on a Medicare card will have a Health Record created, using information the Department of Health has from Medicare & Veteran’s Affairs. You can view and manage your Health Record from myhealthrecord.gov.au. Next time you see the doctor you can ask them to add your information onto your My Health Record. For More information or if you wish to OPT OUT (to opt out patients need to notify the Department of Health by the 27 May 2016), you can go to myhealthrecord.gov.au, call 1800 723 471, or visit your Local Medicare Service Centre, you will need to have your Medicare card and other identification ready if you are opting out. We have arranged for After Hours medical care to be provided by the Sydney Medical Service Co-Operative. If you require medical assistance when the practice is not open, a GP home visit may be arranged by calling (02) 8724 6300. This is a Bulked Billed service for Medicare Card Holders. If you have a complaint please discuss it first with reception or the Doctor, who will ensure it is handled and resolved appropriately. Unresolved complaints may be referred to an external complaints organisation such as the HCCC.